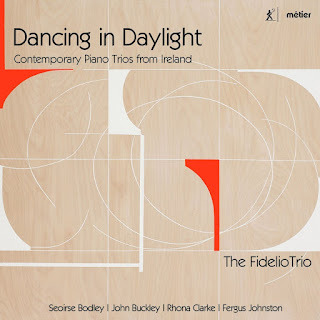 John Buckley's Piano Trio was written for the Fidelio Trio in 2013. In three movements, each movement draws its title and imagery from mechanical devices. 'Shadows and Echoes', inspired by the flickering images of the zoetrope, mixes sustained string tone with piano arpeggios creating wisps and fragments which are evocative and intense, with edgy harmonies. 'Kaleidoscope' uses a short motif which undergoes transformations, in a brilliant up-tempo movement where you sense the rhythmic motif being passed round. 'Music Box' is evocative and rather rhapsodic with a strikingly eerie sense of the music box in the piano figurations. 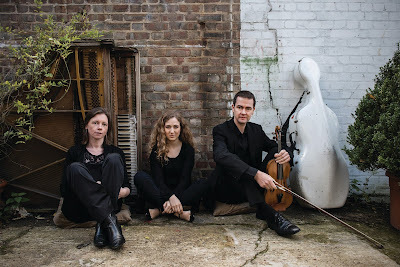 Fergus Johnson's Piano Trio was written for the Fidelio Trio in 2011. All three movements are based on the same four-note motif. The first starts deep and dark in the piano (with hints of the boogie-woogie which surfaces in the second movement). The music fragments as the instruments respond to each other and the discussion gets more intense with a sense of unease. The second movement opens high energy and free-form with an almost boogie-woogie in the piano which, in a disturbing moment, metamorphoses into a tango. The final movement has a real sense of stasis; the composer describes it as threnody. The slow moving piano almost picks out a tone row as the instruments dialogue over the top. Rhona Clarke's Piano Trio No.2 was originally written in 2001, and was revised in 2015. The first movement takes repeated chords on the piano and develops a big lyric dialogue for violin and cello over the top. The contrasting second movement, is an edgy fugato, all crisp rhythms and vivid excitement. 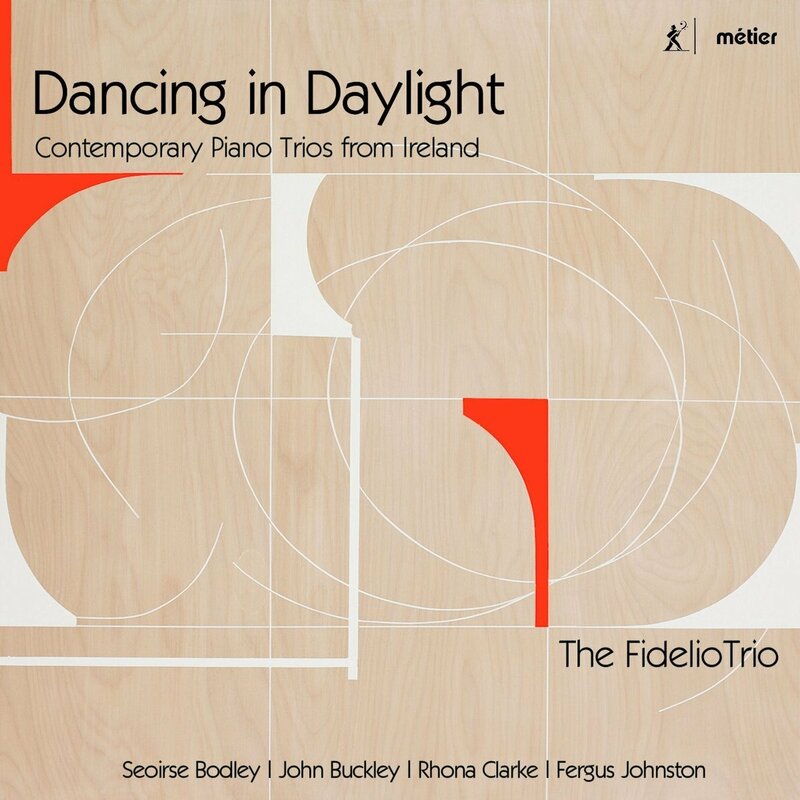 Seourse Bodley's Piano Trio 'Dancing in Daylight' was written in 2014. The first movement opens with big chunky piano chords before developing a lively dynamic texture with the three different instruments interacting. The second movement is fluently melodic, with a lovely intersection of rhythms on the different instruments. The final movement makes plain the element of Irish traditional music hinted at in the first two. After a long and very Celtic violin cadenza there is a lively traditional sounding dance. This is a terrific disc, and the fact that the composers are all well established means that we have four very different but very mature talents responding to the challenge of writing for the tricky but rewarding combination of piano, violin and cello. The Fidelio Trio are to be commended for their commissioning policy, and the performances they gave on this disc are full of vibrant energy and sympathy with the music.